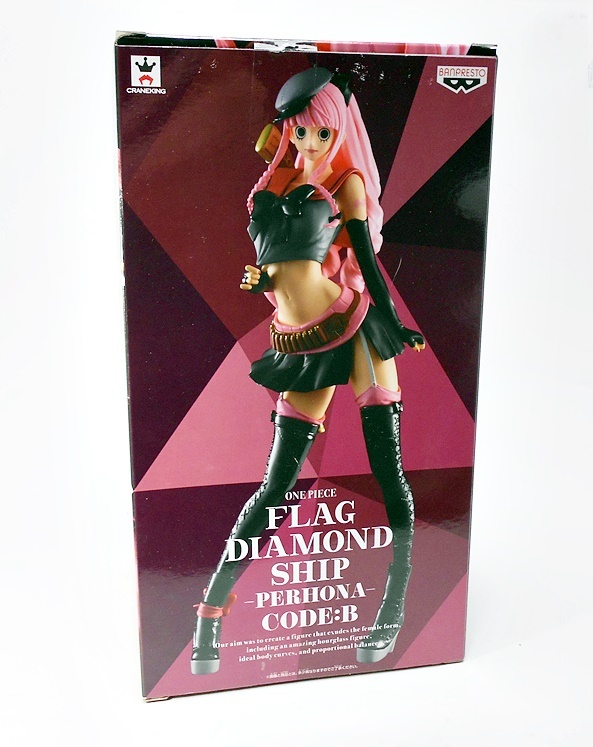 Banpresto has been continuing their Flag Diamond Ship line of 9-inch scaled figures featuring the ladies of One Piece in some rather fetching and unconventional outfits. 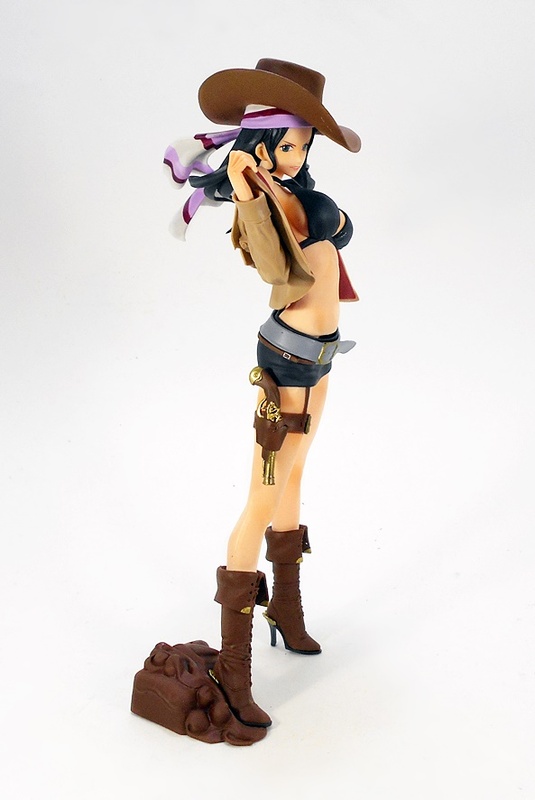 Much earlier this year, I checked out their Boa Hancock and first version of Nami. 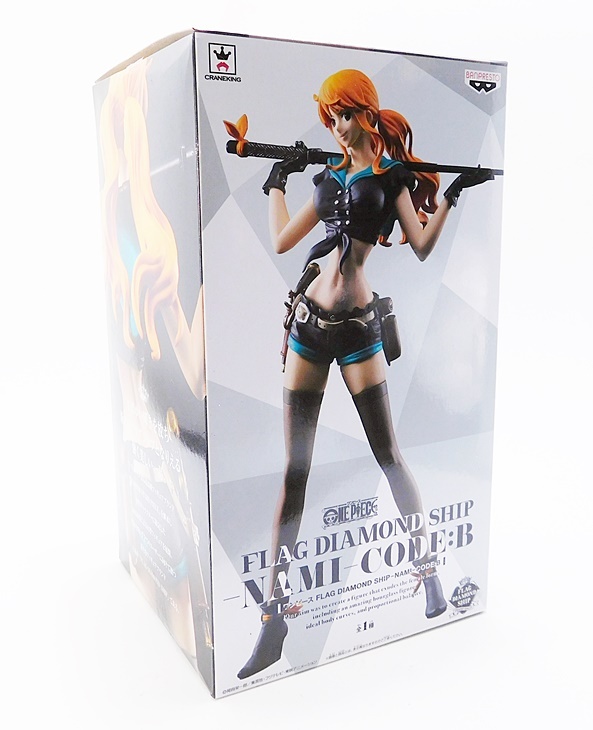 Today I’m going to open up their second version of Nami, called Code: B. Let’s go! The packaging here is standard prize figure stuff right down to the Jamma and Craneking logos. 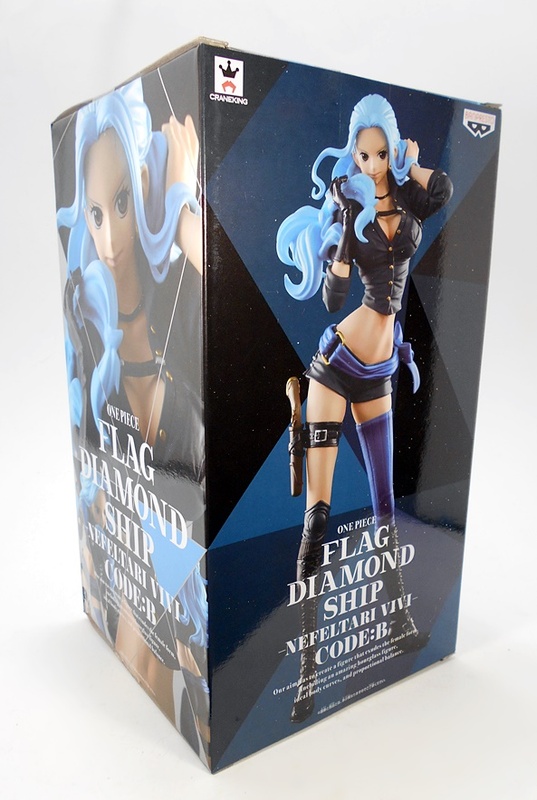 You get a fully enclosed box with some nice shots of the statue inside, along with the line’s mission statement in English, which has a round about way of saying the figures are pure fan service. No surprises there! Inside, the figure comes partially disassembled and wrapped in plastic. 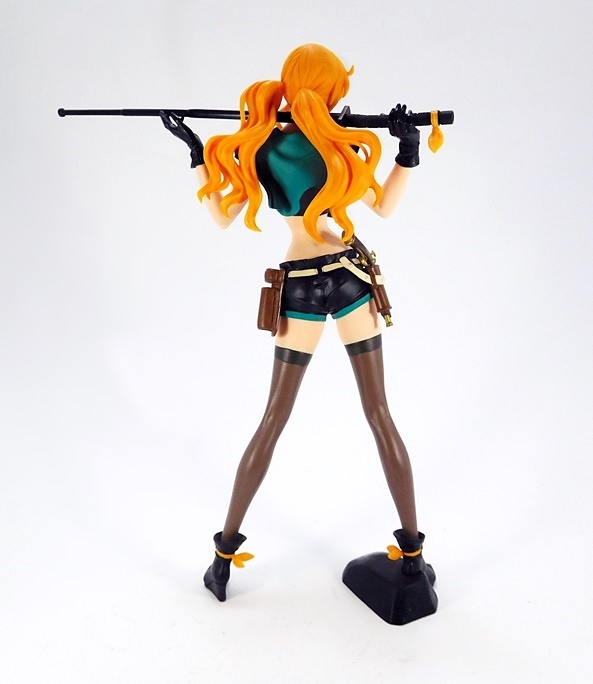 All you have to do is put Nami’s two halves together at the waist, put her right foot into the base, and place her sword in her hand. And ain’t she pretty! 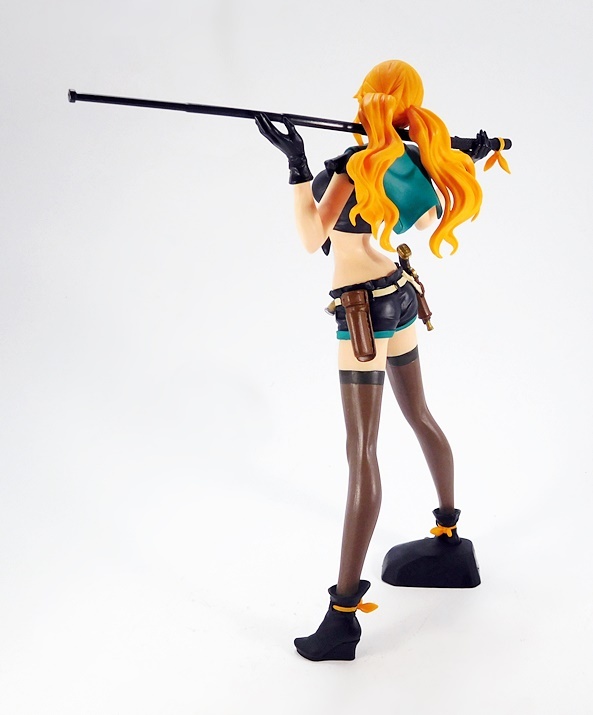 The pose features Nami with a somewhat wide stance and cradling a telescoping sword-baton behind her neck with each hand. The outfit consists of short shorts and a tied off top, both matching black with teal trim. 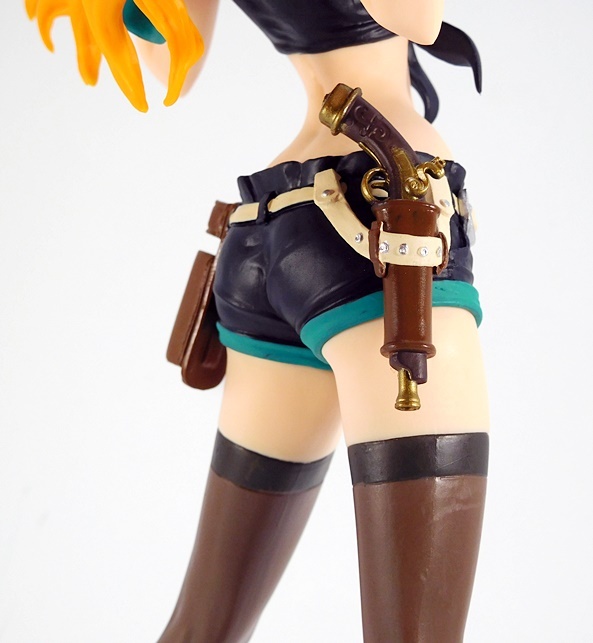 She also sports some black gloves, stockings, and little black boots with orange ties around them. 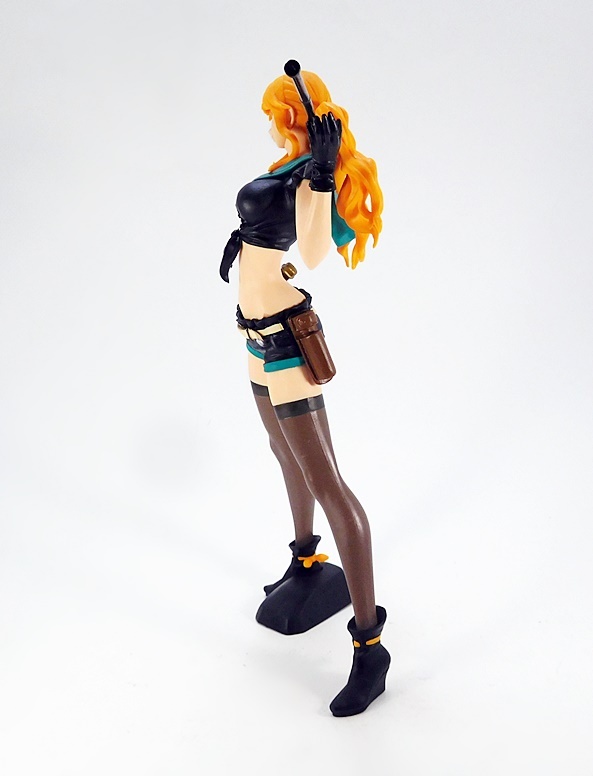 Not exactly a conventional look for Nami, and that’s the point, but I think she looks great. There’s some really nice detail to the outfit, including a sculpted cream colored belt with painted silver studs and buckle. 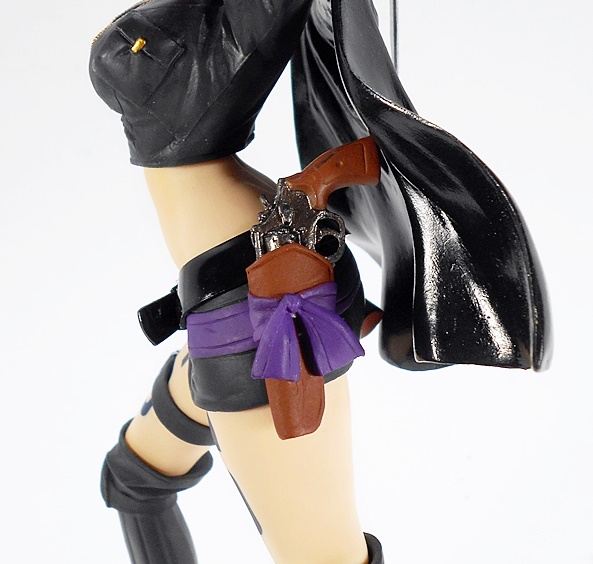 It secures a flintlock pistol to her right hip and a holster for her other weapon on her left hip. 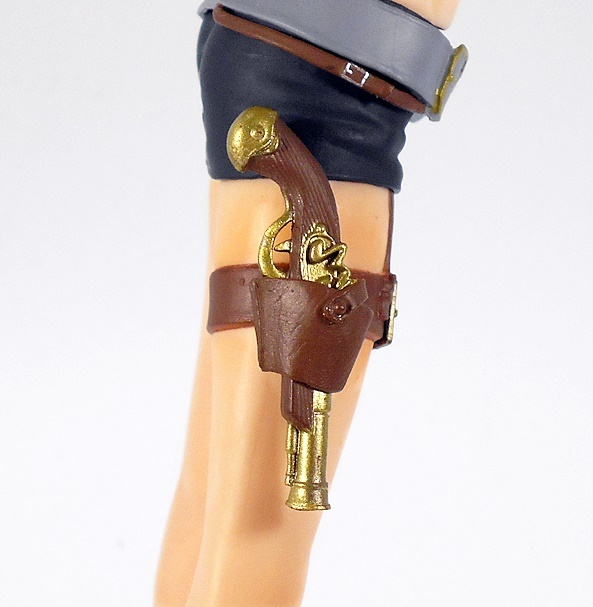 The pistol includes gold painted fixtures and looks great. The top features silver painted buttons running down the front and some poofy ruffles to her shoulder sleeves. 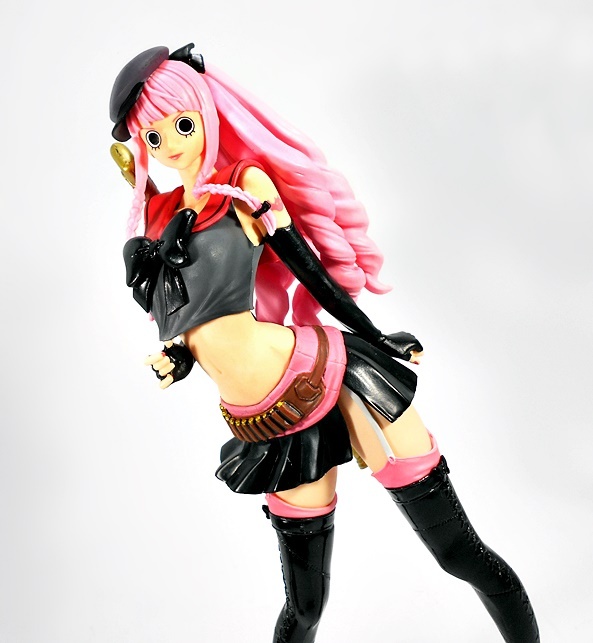 While the outfit might be a bit of a departure, the portrait is 100% Nami. 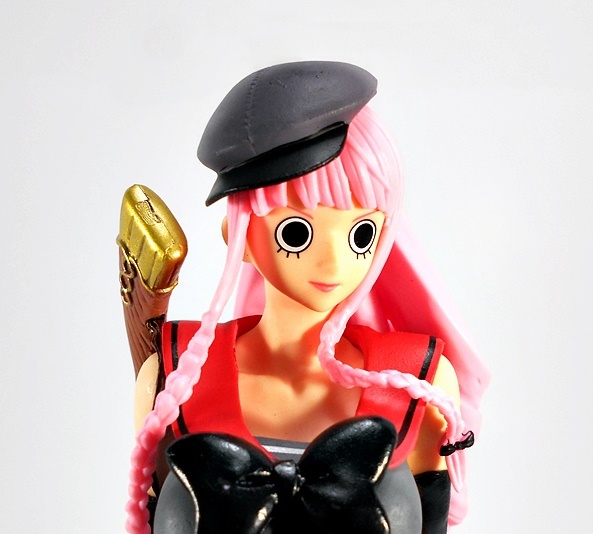 Her big eyes are neatly painted and she’s wearing a wry smile with her head cocked and offering a sideways glance. Someone’s about to get a smack-down. 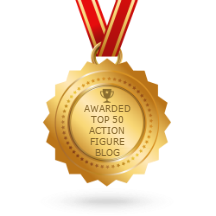 Her vibrant orange hair cascades down her back in two pony-tails with smaller licks curling up in front of her shoulders. 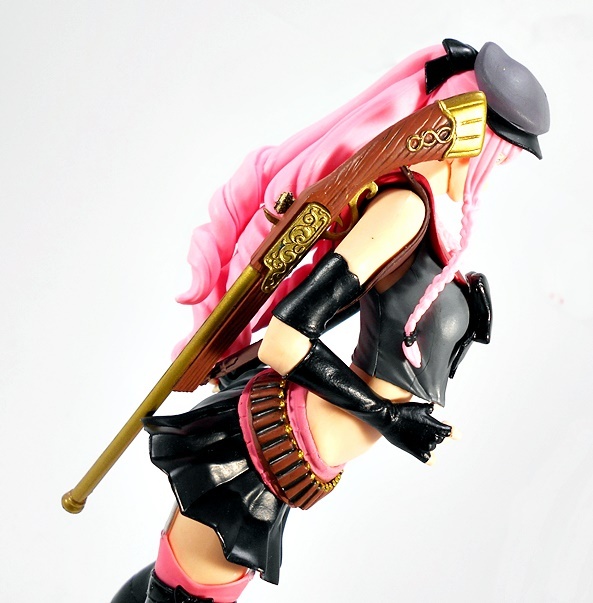 Her weapon is an interesting design, as it has a katana-style hilt with a collapsing baton in place of a blade. I have to confess my ignorance here, because if this is a real weapon, I’ve never seen anything like it before. 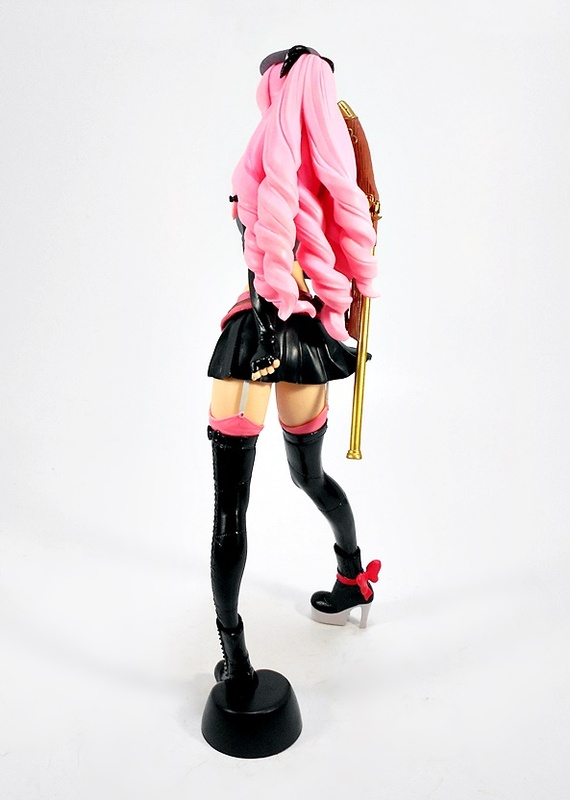 It’s a separate piece that fits into the grasp of her right hand with the other end cradled in her left. 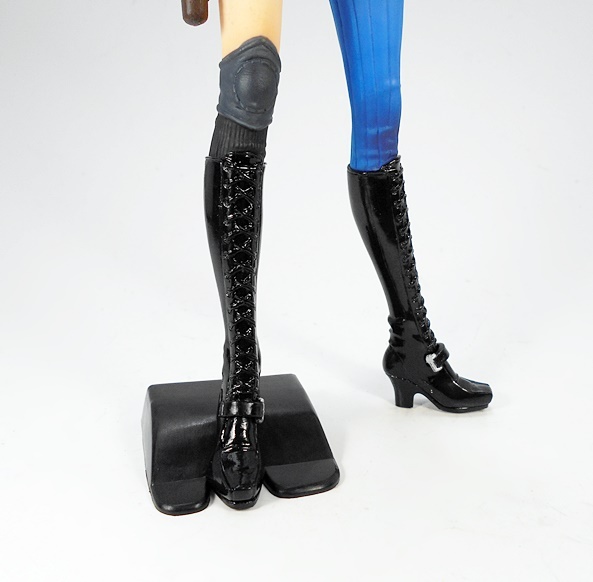 The tactical-style grip is textured and has an orange tie around it that matches the ones on her boots. 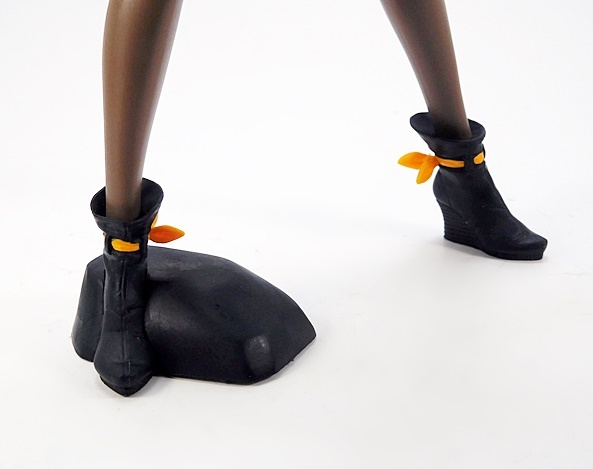 The base is a simple black rock that her right foot pegs into. I’ve seen a lot of complaints about this base not supporting the statue, but mine actually works perfectly. 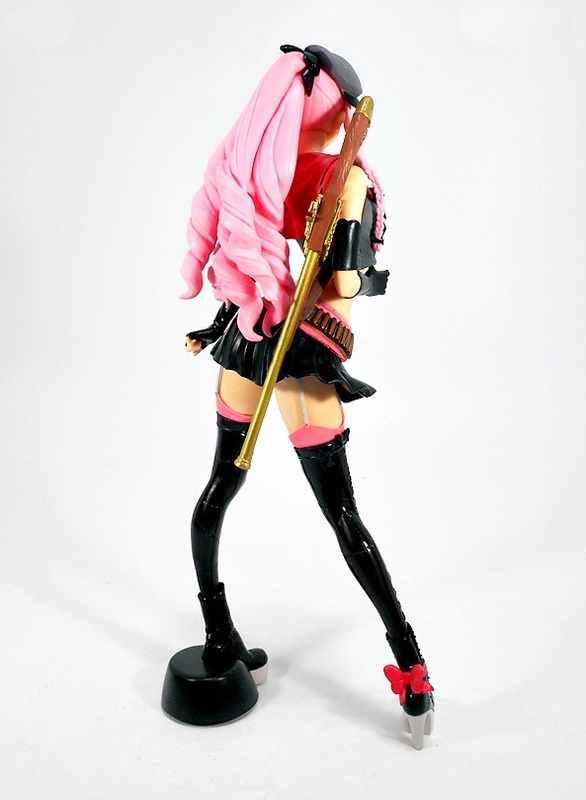 Banpresto seems highly committed to this series, as they have several more figures solicited for pre-order, as well as a few out now that I haven’t picked up yet. They seem to retail around the $25 range, which isn’t bad for what you’re getting. 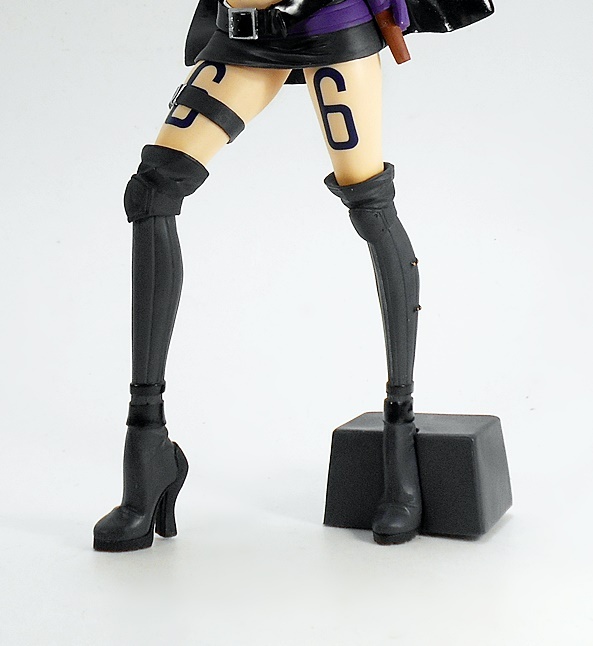 Sure, she isn’t the same quality as a proper scaled figure, but then with a respectable 9-inch scale and a price point at least $100 less than your average scaled figure, I’m really digging these a lot. 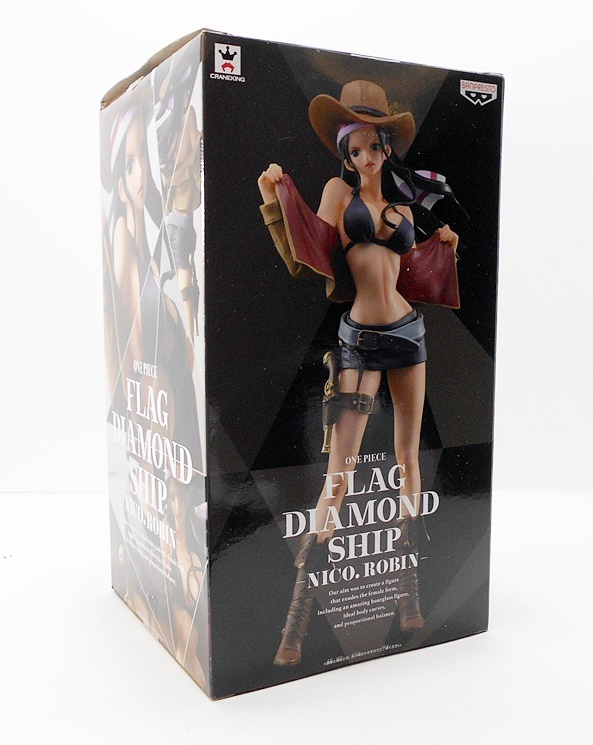 The paint is solid, the sculpts are fun, and I’ve got several more due in soon, so you can bet you’ll be seeing more of the Flag Diamond Ship around here!